Yesterday was a special day. And no I’m not referring to #BlackFriday — but rather to #BlackHoleFriday. I just learned that NASA spawned this social media campaign three years ago. The timing of this year’s Black Hole Friday is particularly special because we are exactly 100 years + 2 days after Einstein published his field equations of general relativity (GR). When Einstein introduced his equations he only had an exact solution describing “flat space.” These equations are notoriously difficult to solve so their introduction sent out a call-to-arms to mathematically-minded-physicists and physically-minded-mathematicians who scrambled to find new solutions. If I had to guess, Karl Schwarzschild probably wasn’t sleeping much exactly a century ago. Not only was he deployed to the Russian Front as a solider in the German Army, but a little more than one month after Einstein introduced his equations, Schwarzschild was the first to find another solution. His solution describes the curvature of spacetime outside of a spherically symmetric mass. It has the incredible property that if the spherical mass is compact enough then spacetime will be so strongly curved that nothing will be able to escape (at least from the perspective of GR; we believe that there are corrections to this when you add quantum mechanics to the mix.) Schwarzchild’s solution took black holes from the realm of clever thought experiments to the status of being a testable prediction about how Nature behaves. It’s worth mentioning that between 1916-1918 Reissner and Nordstrom generalized Schwarzschild’s solution to one which also has electric charge. Kerr found a solution in 1963 which describes a spinning black hole and this was generalized by Newman et al in 1965 to a solution which includes both spin (angular momentum) and electric charge. These solutions are symmetric about their spin axis. It’s worth mentioning that we can also write sensible equations which describe small perturbations around these solutions. And that’s pretty much all that we’ve got in terms of exact solutions which are physically relevant to the 3+1 dimensional spacetime that we live in (it takes three spatial coordinates to specify a meeting location and another +1 to specify the time.) This is the setting that’s closest to our everyday experiences and these solutions are the jumping off points for trying to understand the role that black holes play in astrophysics. As I already mentioned, studying GR using pen and paper is quite challenging. But one exciting direction in the study of astrophysical black holes comes from recent progresses in the field of numerical relativity; which discretizes the calculations and then uses supercomputers to study approximate time dynamics. There are many different viewpoints which yield the BTZ black hole and this is one of them. This is a time=0 slice of the BTZ black hole obtained by gluing together special curves (geodesics) related to each other by a translation symmetry. The BTZ black hole is a solution of Einstein’s equations in 2+1d which has two asymptotic regions which are causally separated from each other by an event horizon. The arrows leading to “quantum states” come into play when you use the BTZ black hole as a toy model for thinking about quantum gravity. As 2d surfaces: the sphere is positively curved; a saddle has negative curvature; and a plane has zero curvature. There are no gravitational waves. Technically, this is because the Riemann tensor is fully determined by the Ricci tensor — the number of degrees of freedom in this system is exactly equal to the number of constraints given by Einstein’s equations. This makes GR in 2+1d something called a “topological field theory” which is much easier to quantize than its full blown gauge theory cousin in 3+1d. The maximally symmetric vacuum solution with negative curvature, which we call Anti de-Sitter space, has a beautiful symmetry. This manifold is exactly equal to the “group manifold” SL(2,R). This enables us to translate many challenging analytical questions into simple algebraic computations. In particular, it enables us to find a huge category of solutions which we call multiboundary wormholes, with BTZ being the most famous example. 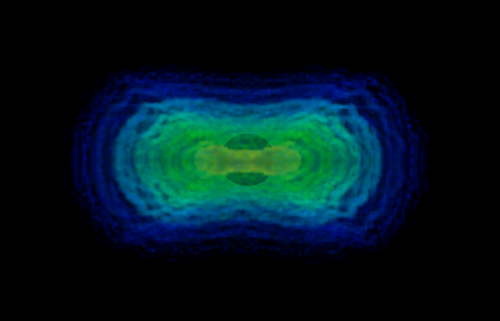 Some “multiboundary wormhole” pictures that I made. The left shows the constant time=0 slice for a few different solutions and what you are left with after gluing according to the equations on the right. These are solutions to GR in 2+1d. Classically, a particle is in one definite location. In quantum mechanics, a particle can be in a superposition of places. In quantum gravity, can spacetime be in a superposition of geometries? How does this work? When you go from classical physics to quantum physics, tunneling becomes a thing. Can the same thing happen with quantum gravity? Where we tunnel from one spacetime geometry to another? What controls the transition amplitudes? The holographic principle is an incredibly important idea in modern theoretical physics. It stems from the fact that the entropy of a black hole is proportional to the area of its event horizon — whereas the entropy of a glass of water is proportional to the volume of water inside the glass. We believe that this reduction in dimensionality is wildly significant. 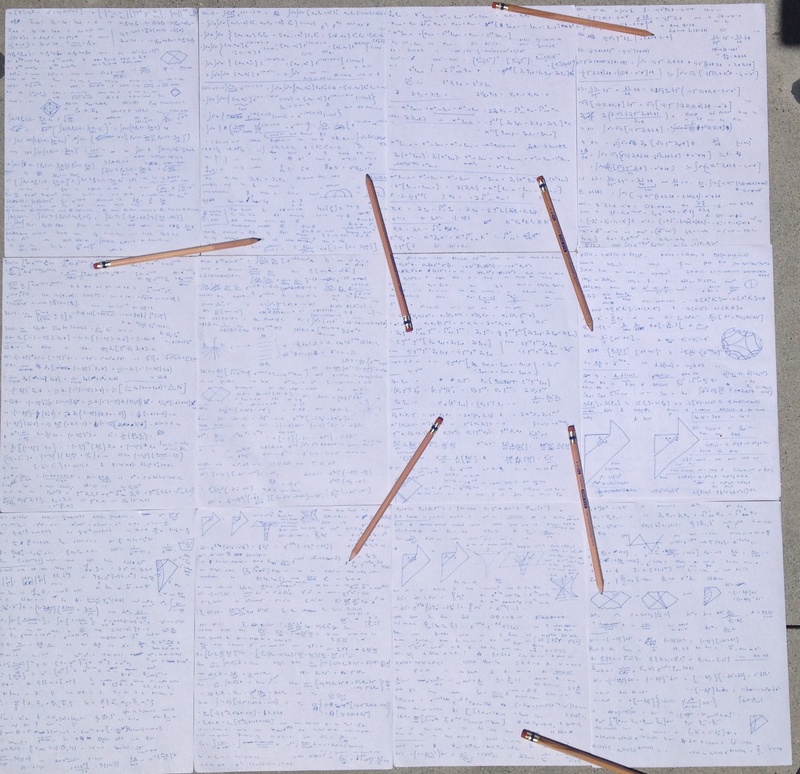 A few years after the holographic principle was introduced in the early 1990’s, by Gerard ‘t Hooft and Lenny Susskind, Juan Maldacena came up with a concrete manifestation which is now called the AdS/CFT correspondence. Maldacena’s paper has been cited over 14k times making it one of the most cited theoretical physics papers of all time. However, despite having a “correspondence” it’s still very hard to translate questions back and forth between the “gravity and quantum sides” in practice. 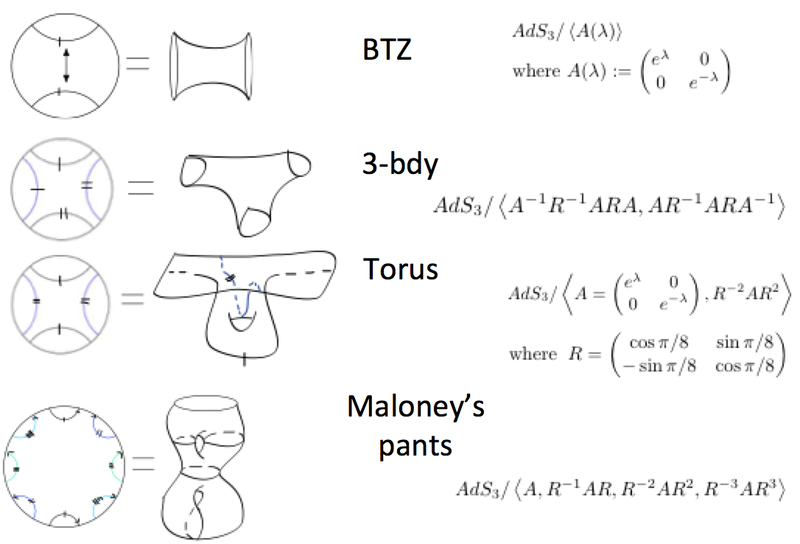 The BTZ black hole is the gravity solution where this correspondence is best understood. Its quantum dual is a state called the thermofield double, which is given by: . This describes a quantum state which lives on two circles (see my BTZ picture above.) There is entanglement between the two circles. If an experimentalist only had access to one of the circles and if they were asked to try to figure out what state they have, their best guess would be a “thermal state.” A state that has been exposed to a heat-bath for too long and has lost all of its initial quantum coherence. It is in this sense that the BTZ black hole has been hugely important. It’s also evidence of how mysterious Einstein’s equations still remain, even to this day. We still don’t have exact solutions for many settings of interest, like for two black holes merging in 3+1d. It was only in 1992 that BTZ came up with their solution–77 years after Einstein formulated his theory! Judging by historical precedence, exactly solvable toy models are profoundly useful and BTZ has already proven to be an important signpost as we continue on our quest to understand quantum gravity. There’s already broad awareness that astrophysical black holes are fascinating objects. In this post I hope I conveyed a bit of the excitement surrounding how black holes are useful in a different setting — in aiding our understanding of quantum gravity. And all of this is in the spirit of #BlackHoleFriday, of course. I’ve been thinking about this topic for well over a decade but my interest bubbled over last week and I decided to write this post. Some entrepreneur friends were on a panel at Caltech (John Hering, Diego Berdakin and Joe Lonsdale) and during a wonderful sub-convo about increasing gender diversity in STEM a male undergrad asked: “as someone who’s only a student, what can I do to help with this issue?” The panel pretty much nailed it with their responses but this is an incredibly important issue and I want to capture some of their comments in writing, to frame this with broader context and to add some personal anecdotes. Before providing a few recommendations here are some bullets which I think are important in terms of framing this issue. 1. Full stack problem: this isn’t an issue that can be tackled by targeting any specific age range. It especially can’t be tackled by only focusing on recruitment for colleges or STEM jobs. Our current lack of diversity literally starts the day children are born. We have a broad culture of pushing kids away from STEM but these pressures disproportionately target girls. 2. Implicit biases: one of the most damaging and least spoken about mechanisms through which this happens are implicit biases. Very few people understand the depth of this issue and as an extension how guilty WE ALL ARE. Implicit biases are pervasive and they are pushing girls out of STEM. Here are examples from my own childhood which highlight how subtle the issue is. I have a younger sister who has basically the same brain as myself (truly, we can read each others minds.) I became a theoretical physicist and entrepreneur and she’s a lawyer. This is obviously a worthy profession but how did we choose these paths? For years I’ve been looking back and trying to answer this question. Upon reflection, I was astonished by the strength of my implicit biases. a. An Uncle helped me build a computer when I was seven. No one did the same for my sister. I spent most of the ages of 7-16 hacking around on computers which provided the foundation for many of the things that I’ve done in my adult life. This gesture by my Uncle was easily one of the most impactful things that anyone has ever done for me. b. When my sister had computer problems I would treat her like she’s stupid and simply fix the problem for her (these words are overly dramatic but I’m trying to make a point.) Whereas when my male cousin had issues I would sit next to him and patiently explain the underlying issue and teach him how to fix his problem. That teaching a man to fish metaphor is a thing. c. When people gave us presents they would give me Legos and my sister art supplies or clothes. Gifts didn’t always fall into these categories (obviously) but they almost always had a similar gender-specific split. d. When I was the first to finish my multiplication tables in 3rd grade, my teacher encouraged me to read science books. When my sister finished she was encouraged to draw. This teacher was female. e. These are only a few examples of implicit biases. I wasn’t aware of the potential cause-and-effect of my actions while making them. Only after years of reflection and seeing how amplified the problem becomes by making it to the tip of the funnel was I able to connect these personal dots. These biases are so deeply engrained that addressing them requires societal-scale reprogramming — but it starts with enhanced self-awareness. I obviously feel some level of guilt for being oblivious to these actions as a kid. And I’d be delusional to think I’m beyond having similar biases today. a. “Geoff Marcy was a serial harasser for at least twenty years” — Gizmodo. b. “Why women are poor at science, by Harvard president (Larry Summers)” — Guardian headline. Granted, his comments were more nuanced than the media portrayed. But in any case, extremely damaging and evidence of an outmoded way of thinking. c. “Could it be that researchers find a hiring bias that favors women?” — NPR. I wanted to include this example to highlight that sometimes systematic biases (this isn’t exactly an explicit bias) go the other direction. But of course if we search hard enough we will be able to find specific instances in the stack where the bias favors women. My personal interpretation of this headline is: “the fearless women that have braved decades of doubt may have a minuscule advantage when competing for STEM jobs, but only after they have been disproportionately filtered out of the applicant pool on a massive scale.” Here are some statistics which show why this headline is only scratching the surface: NGCP and Techbridge. If we acknowledge that this is a problem that literally starts the day children are born, then what can we, as individuals, do about it? 1. Constantly run a mental loop to check your implicit biases. I’m hoping we can compile a list of examples in the comments that can serve as a check-list of things NOT TO DO! E.g. When you ask: “what do you want to be when you grow-up?” Don’t answer before kids can get back to you with something like: “be a princess?” or “be a baseball player?” Those kids might want to be mathematicians! Maryam Mirzakhani or Terry Tao! 2. Provide encouragement to young girls without being over the top or condescending. Here’s a simple example from the past week. A.K. is ~8 years old and she visited Caltech recently (yes, I got permission from her mother to use this example.) This girl is a rockstar. The tragic reality is that A.K. is going to spend her next decade being pushed away from STEM. Don’t get me wrong, she’s lucky to have encouraging parents who are preempting this push, but they will be competing with the sway of the media and her peers. Small gestures, such as @Caltechedu reposting the above photo on Instagram provides a powerful dosage of motivation. The way I think about it is this: kids, but especially girls, are going to face a persistent push away from STEM. They are going to get teased for being “too smart” + “not girly enough” + “weird” + “nerdy” + etc. Small votes of confidence from people that have made it through and can therefore speak with authority are like little bits of body armor. Comments sting a little bit less when the freedom+success of the other side is visible and you’re being told that you can make it too. Don’t underestimate the power of small gestures. One comment can literally make a world of difference. Do this. But it absolutely must be genuine. 3. Make a conscious effort to share your passion + enthusiasm for STEM. Our culture does an abysmal job of motivating and promoting the beauty + wonder of science. This advice applies to both girls and boys and it’s incredibly important. One of my favorite essays is “A Mathematician’s Lament” by Paul Lockhart. In it he contrasts the way that we teach mathematics compared to how we teach painting and music. Imagine if before letting kids see a finished masterwork or picking up a brush and playing around, we forced them to learn: color theory, the history of art, how to hold a brush, etc! If you’re at Caltech then invite kids to the SURF seminar day or to interesting public lectures. Go give a talk at a local school and explain via examples that science is a work in progress — there’s an infinite amount that we still don’t know! For example, a brilliant non-physicist hacker friend asked me yesterday if the Casimir effect is temperature dependent? The answer is yes, but this is still barely understood theoretically. At what temperature will a gecko’s stick stop working? Questions like this are engaging. It will only take a few hours of your time to emphasize to dozens of kids how exciting science is. Outreach is usually asymmetric. As an aside, writing this reminded me of an outreach story from 2010. Somehow I finagled travel funds to attend the International Congress of Mathematicians (ICM) in Hyderabad, India. During our day off (one day during a two week conference), I set out early to do some sightseeing and a dude pulled up next to me on a scooter. He asked if I was there for the congress. It’s kind of a long story but after chatting for a bit I agreed to spend the day riding around on his scooter while spreading my passion for mathematics at a variety of schools in the Hyderabad area. I lectured to hundreds of kids that day. I wrote a blog post that ended up getting picked up by a few national newspapers and even made the official ICM newsletter (page six of this; FYI they condensed my post and convoluted some facts.) I’m sure that I ended up benefitting wayyyyyy more from my outreach than any of the students I spoke to. The crazy reality is that outreach is oftentimes like this. 4. There is literally nothing more rewarding than mentoring hyper talented kids and then watching them succeed. This is also incredibly asymmetric. Two hours of your time will provide direction and motivation for months. Do not discount the power of giving kids confidence and a small amount of direction. In this post, I ignored some very important parts of the problem and also opportunities for addressing it in an attempt to focus on aspects that I think are under appreciated. Specifically how pervasive implicit biases are and how asymmetric outreach is. Increasing diversity in STEM is a societal scale problem that isn’t going to be fixed overnight. However, I believe it’s possible to make huge progress over the next two decades. We’re in the process of taking our first step, which is global-awareness of the problem. And now we need to take the next step which is broad self-awareness about the impacts of our individual actions and implicit biases. It seems to me like wildly increasing our talent pool is a useful endeavor. In the spirit of this blog, unlocking this hidden potential might even be the key to making progress with quantum gravity! And definitely towards making progress on an innumerable number of other science and engineering goals. One of my roommates, Jason Porath, makes Rejected Princesses. This is a great site that all young girls should be aware of. Think badass women meet Disney glorification from a feminist perspective. IQIM is heavily involved w/ Project Scientist which is a great program for young girls with an aptitude and interest in STEM. In anticipation of The Theory of Everything which comes out today, and in the spirit of continuing with Quantum Frontiers’ current movie theme, I wanted to provide an overview of Stephen Hawking’s pathbreaking research. Or at least to the best of my ability—not every blogger on this site has won bets against Hawking! 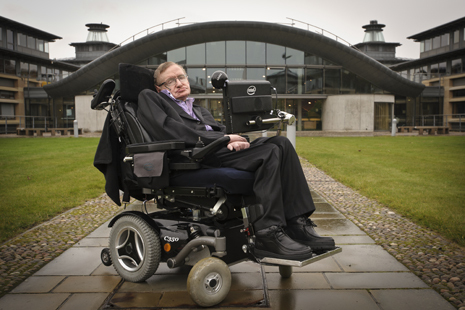 In particular, I want to describe Hawking’s work during the late ‘60s and through the ’70s. His work during the ’60s is the backdrop for this movie and his work during the ’70s revolutionized our understanding of black holes. As additional context, this movie is coming out at a fascinating time, at a time when Hawking’s contributions appear more prescient and important than ever before. I’m alluding to the firewall paradox, which is the modern reincarnation of the information paradox (which will be discussed below), and which this blog has discussed multiple times. Progress through paradox is an important motto in physics and Hawking has been at the center of arguably the most challenging paradox of the past half century. I should also mention that despite irresponsible journalism in response to Hawking’s “there are no black holes” comment back in January, that there is extremely solid evidence that black holes do in fact exist. Hawking was referring to a technical distinction concerning the horizon/boundary of black holes. Now let’s jump back and imagine that we are all young graduate students at Cambridge in the early ‘60s. Our protagonist, a young Hawking, had recently been diagnosed with ALS, he had recently met Jane Wilde and he was looking for a thesis topic. This was an exciting time for Einstein’s Theory of General Relativity (GR). The gravitational redshift had recently been confirmed by Pound and Rebka at Harvard, which put the theory on extremely solid footing. This was the third of three “classical tests of GR.” So now that everyone was truly convinced that GR is correct, it became important to get serious about investigating its most bizarre predictions. Hawking and Penrose picked up on this theme most notably.The mathematics of GR allows for singularities which lead to things like the big bang and black holes. This mathematical possibility was known since the works of Friedmann, Lemaitre and Oppenheimer+Snyder starting all the way back in the 1920s, but these calculations involved unphysical assumptions—usually involving unrealistic symmetries. Hawking and Penrose each asked (and answered) the questions: how robust and generic are these mathematical singularities? Will they persist even if we get rid of assumptions like perfect spherical symmetry of matter? What is their interpretation in physics? Singularity theorems applied to cosmology: Hawking’s first major results, starting with his thesis in 1965, was proving that singularities on the cosmological scale—such as the big bang—were indeed generic phenomena and not just mathematical artifacts. This work was published immediately after, and it built upon, a seminal paper by Penrose. Also, I apologize for copping-out again, but it’s outside the scope of this post to say more about the big bang, but as a rough heuristic, imagine that if you run time backwards then you obtain regions of infinite density. Hawking and Penrose spent the next five or so years stripping away as many assumptions as they could until they were left with rather general singularity theorems. Essentially, they used MATH to say something exceptionally profound about THE BEGINNING OF THE UNIVERSE! Namely that if you start with any solution to Einstein’s equations which is consistent with our observed universe, and run the solution backwards, then you will obtain singularities (regions of infinite density at the Big Bang in this case)! However, I should mention that despite being a revolutionary leap in our understanding of cosmology, this isn’t the end of the story, and that Hawking has also pioneered an attempt to understand what happens when you add quantum effects to the mix. This is still a very active area of research. Singularity theorems applied to black holes: the first convincing evidence for the existence of astrophysical black holes didn’t come until 1972 with the discovery of Cygnus X-1, and even this discovery was wrought with controversy. So imagine yourself as Hawking back in the late ’60s. He and Penrose had this powerful machinery which they had successfully applied to better understand THE BEGINNING OF THE UNIVERSE but there was still a question about whether or not black holes actually existed in nature (not just in mathematical fantasy land.) In the very late ‘60s and early ’70s, Hawking, Penrose, Carter and others convincingly argued that black holes should exist. Again, they used math to say something about how the most bizarre corners of the universe should behave–and then black holes were discovered observationally a few years later. Math for the win! No hair theorem: after convincing himself that black holes exist Hawking continued his theoretical studies about their strange properties. In the early ’70s, Hawking, Carter, Israel and Robinson proved a very deep and surprising conjecture of John Wheeler–that black holes have no hair! This name isn’t the most descriptive but it’s certainly provocative. More specifically they showed that only a short time after forming, a black hole is completely described by only a few pieces of data: knowledge of its position, mass, charge, angular momentum and linear momentum (X, M, Q, J and L). It only takes a few dozen numbers to describe an exceptionally complicated object. Contrast this to, for example, 1000 dust particles where you would need tens of thousands of datum (the position and momentum of each particle, their charge, their mass, etc.) This is crazy, the number of degrees of freedom seems to decrease as objects form into black holes? Black hole thermodynamics: around the same time, Carter, Hawking and Bardeen proved a result similar to the second law of thermodynamics (it’s debatable how realistic their assumptions are.) Recall that this is the law where “the entropy in a closed system only increases.” Hawking showed that, if only GR is taken into account, then the area of a black holes’ horizon only increases. This includes that if two black holes with areas and merge then the new area will be bigger than the sum of the original areas . Combining this with the no hair theorem led to a fascinating exploration of a connection between thermodynamics and black holes. Recall that thermodynamics was mainly worked out in the 1800s and it is very much a “classical theory”–one that didn’t involve either quantum mechanics or general relativity. The study of thermodynamics resulted in the thrilling realization that it could be summarized by four laws. Hawking and friends took the black hole connection seriously and conjectured that there would also be four laws of black hole mechanics. In my opinion, the most interesting results came from trying to understand the entropy of black hole. The entropy is usually the logarithm of the number of possible states consistent with observed ‘large scale quantities’. Take the ocean for example, the entropy is humungous. There are an unbelievable number of small changes that could be made (imagine the number of ways of swapping the location of a water molecule and a grain of sand) which would be consistent with its large scale properties like it’s temperature. However, because of the no hair theorem, it appears that the entropy of a black hole is very small? What happens when some matter with a large amount of entropy falls into a black hole? Does this lead to a violation of the second law of thermodynamics? No! It leads to a generalization! Bekenstein, Hawking and others showed that there are two contributions to the entropy in the universe: the standard 1800s version of entropy associated to matter configurations, but also contributions proportional to the area of black hole horizons. When you add all of these up, a new “generalized second law of thermodynamics” emerges. Continuing to take this thermodynamic argument seriously (dE=TdS specifically), it appeared that black holes have a temperature! As a quick aside, a deep and interesting question is what degrees of freedom contribute to this black hole entropy? In the late ’90s Strominger and Vafa made exceptional progress towards answering this question when he showed that in certain settings, the number of microstates coming from string theory exactly reproduces the correct black hole entropy. Black holes evaporate (Hawking Radiation): again, continuing to take this thermodynamic connection seriously, if black holes have a temperature then they should radiate away energy. But what is the mechanism behind this? This is when Hawking fearlessly embarked on one of the most heroic calculations of the 20th century in which he slogged through extremely technical calculations involving “quantum mechanics in a curved space” and showed that after superimposing quantum effects on top of general relativity, there is a mechanism for particles to escape from a black hole. Making all of this more rigorous: Hawking spent most of the rest of the ’70s making all of this more rigorous and stripping away assumptions. One particularly otherworldly and powerful tool involved redoing many of these black hole calculations using the euclidean path integral formalism. I’m certain that I missed some key contributions and collaborators in this short history, and I sincerely apologize for that. However, I hope that after reading this you have a deepened appreciation for how productive Hawking was during this period. He was one of humanity’s earliest pioneers into the uncharted territory that we call quantum gravity. And he has inspired at least a few generations worth of theoretical physicists, obviously, including myself. In addition to reading many of Hawking’s original papers, an extremely fun source for this post is a book which was published after his 60th birthday conference. Burning Man… what a controversial topic these days. The annual festival received quite a bit of media attention this year, with a particular emphasis on how the ‘tech elite’ do burning man. Now that we are no longer in the early September Black Rock City news deluge I wanted to forever out myself as a raging hippie and describe why I keep going back to the festival: for the science of course! This is a view of my camp, the Phage, as viewed from the main street in Black Rock City. I have no idea why the CH-47 is doing a flyover… everything else is completely standard for Burning Man. Notice the 3 million Volt Tesla coil which my roommates built. I suspect that at this point, this motivation may seem counter-intuitive or even implausible, but let me elaborate. First, we should start with a question: what is Burning Man? Answer: this question is impossible to answer. The difficulty of answering this question is why I’m writing this post. Most people oversimplify and describe the event as a ‘bunch of hippies doing drugs in the desert’ or as ‘a music festival with a dash of art’ or as ‘my favorite time of the year’ and on and on. There are nuggets of truth in all of these answers but none of them convey the diversity of the event. With upwards of 65,000 people gathered for a week, my friends and I like to describe it as a “choose your own adventure” sort of experience. I choose science. Dr. F and Dr. B’s 3 million Volt musical Tesla coil. Humans were inserted for scale. Musical Tesla coil: two of my roommates built a 3 million Volt musical Tesla coil. Think about this… it’s insane. The project started while they were writing their Caltech PhD theses (EE and Applied Physics) and in my opinion, the Tesla coil’s scale is a testament to the power of procrastination! Thankfully, they both finished their PhDs. After doing so, they spent the months between their defenses and Burning Man building the coil in earnest. 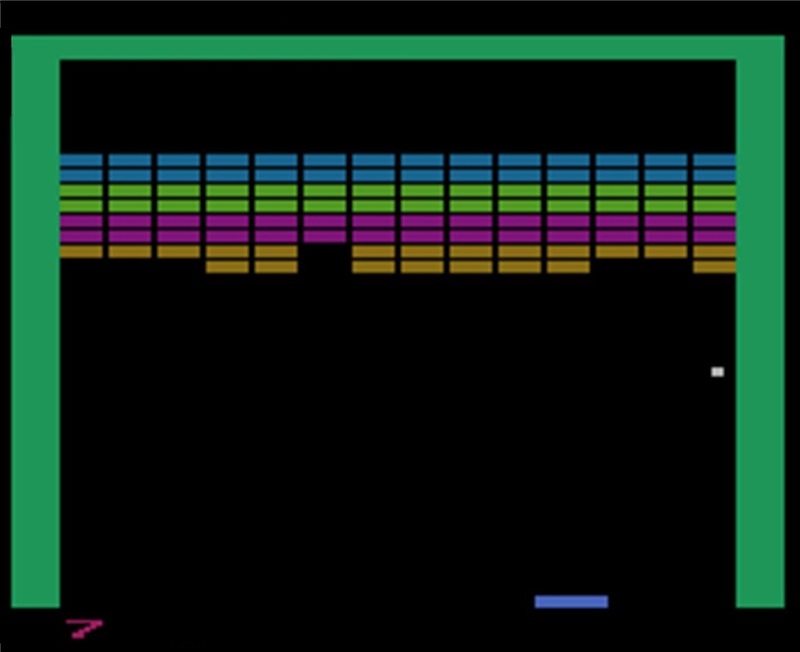 Not only was the coil massive–with the entire structure standing well over 20 feet tall–but it was connected through MIDI to a keyboard. Sound is just pressure waves moving through air, and lightning moves lots of air, so this was one of the loudest platforms on the playa. I manned the coil one evening and one professional musician told me it was “by far the coolest instrument he has ever played.” Take a brief break from reading this and watch this video! Dr. Brainlove getting ready for a midnight stroll and then getting a brainlift. Dr. Brainlove: we built a colossal climbable “art car” in the shape of a brain which was covered in LEDs and controlled from a wireless EEG device. Our previous art car (Dr. Strangelove) died at the 2013 festival, so last winter our community rallied and ‘brainstormed’ the theme for this vehicle. After settling on a neuroscience theme, one of my campmates in Berkeley scanned her brain and sent a CAD file to Arcology Now in Austin, TX who created an anatomically correct steel frame. We procured a yellow school bus which had been converted to bio diesel. We raised over $30k (there were donations beyond indiegogo.) About 20 of my campmates volunteered their weekends to work at the Nimby in Oakland: hacking apart the bus, building additional structures, covering the bus with LEDs, installing a sound system, etc. One of the finishing touches was that one of my campmates who is a neurosurgeon at UCSD procured some wireless EEG devices and then he and some friends wrote software to control Dr. Brainlove’s LEDs–thus displaying someone’s live brain activity on a 30′ long by 20′ tall climbable musical art car for the entire playa to see! We already have plans to increase the LED density and therefore put on a more impressive interactive neural light show next year. Sugarcubes: in 2013, some campmates built an epic LED sculpture dubbed “the sugarcubes”. Just watch this video and you’ll be blown away. The cubes weren’t close to operational when they arrived so there was 48 hours of hacking madness by Dan Kaminsky, Alexander Green and many brilliant others before our “Tuesday night” party. The ethos is similar to the Caltech undergrad’s party culture–the fun is in the building–don’t tell my friends but I slept through the actual party. Ask a scientist on the left (I’m in there somewhere and so is one of my current roommates– another Caltech PhD ’13.) Science class on the right. Science everywhere! Ask a scientist: there’s no question that this is my favorite on playa activity. This photo doesn’t do the act justice. Imagine a rotating cast of 7-8 phagelings braving dust storms and donning lab coats all FOR SCIENCE! The diversity of questions is incredible and I always learn a tremendous amount (evidenced by losing my voice three years running.) For example, this year, a senior executive at Autodesk approached and asked me a trick question related to the Sun’s magnetic field. Fear not–I was prepared! This has happened before.. and he was wearing a “space” t-shirt so my guard was up. A nuclear physicist from UCLA asked me to explain Bell test experiments (and he didn’t even know my background.) Someone asked how swamp coolers work? To be honest, I didn’t have a clear answer off the top of my head so I called over one of my friends (who was one of the earliest pioneers of optogenetics) and he nailed it immediately. Not having a clear answer to this question was particularly embarrassing because I’ve spent most of the past year thinking about something akin to quantum thermodynamics… if you can call black hole physics and holographic entanglement that. Make/hack sessions: I didn’t participate in any of these this year but some of my campmates teach soldering/microscopy/LED programming/etc classes straight out of our camp. See photo above. Science talks: we had 4-5 science talks in a carpeted 40ft geodesic dome every evening. This is pretty self explanatory and by this point in my post, the Phage may have enough credibility that you’d believe the caliber is exceptional. Yup, Burning Man is just a bunch of hippies doing drugs in the desert. You shouldn’t come. You definitely wouldn’t enjoy it. No fun is had and no ideas are shared. Or in other words, Burning Man: where exceptionally capable people prepare themselves for the zombie apocalypse. I spent the past two weeks profoundly confused. I’ve been trying to get up to speed on this firewall business and I wanted to understand the picture below. [Technical paragraph that you can skip.] I’ve been trying to understand why the picture on the left is correct, even though my intuition said the middle picture should be (intuition should never be trusted when thinking about quantum gravity.) The details of these pictures are technical and tangential to this post, but the brief explanation is that these pictures are called Penrose diagrams and they provide an intuitive way to think about the time dynamics of black holes. The two diagrams on the left represent the same physics as the schematic diagram on the right. I wanted to understand why during Hawking radiation, the radial momentum for partner modes is in the same direction. John Preskill gave me the initial reasoning, that “radial momentum is not an isometry of Schwarzchild or Rindler geometries,” then I struggled for a few weeks to unpack this, and then Dan Harlow rescued me with some beautiful derivations that make it crystal clear that the picture on the left is indeed correct. I wanted to understand this because if the central picture is correct, then it would be hard to catch up to an infalling Hawking mode and therefore to verify firewall weirdness. The images above are simple enough, but maybe the image below will give you a sense for how much of an uphill battle this was! This pretty much sums up my last two weeks (with the caveat that each of these scratch sheets is double sided!) Or in case you wanted to know what a theoretical physicist does all day. After four or five hours of maxing out my brain, it starts to throb. For the past couple of weeks, after breaking my brain with firewalls each day, I’ve been switching gears and reading about black hole astronomy (real-life honest-to-goodness science with data!) Beyond wanting to know the experimental state-of-the-art related to the fancy math I’ve been thinking about, I also had the selfish motivation that I wanted to do some PR maintenance after Nature’s headline: “Stephen Hawking: ‘There are no black holes’.” I found this headline infuriating when Nature posted it back in January. When taken out of context, this quote makes it seem like Stephen Hawking was saying “hey guys, my bad, we’ve been completely wrong all this time. Turn off the telescopes.” When in reality what he was saying was more like: “hey guys, I think this really hard modern firewall paradox is telling us that we’ve misunderstood an extremely subtle detail and we need to make corrections on the order of a few Planck lengths, but it matters!” When you combine this sensationalism with Nature’s lofty credibility, the result is that even a few of my intelligent scientist peers have interpreted this as the non-existence of astrophysical black holes. Not to mention that it opens a crack for the news media to say things like: ‘if even Stephen Hawking has been wrong all this time, then how can we possibly trust the rest of this scientist lot, especially related to climate change?’ So brain throbbing + sensationalism => learning black hole astronomy + PR maintenance. Before presenting the evidence, I should wave my hands about what we’re looking for. You have all heard about black holes. They are objects where so much mass gets concentrated in such a small volume that Einstein’s general theory of relativity predicts that once an object passes beyond a certain distance (called the event horizon), then said object will never be able to escape, and must proceed to the center of the black hole. Even photons cannot escape once they pass beyond the event horizon (except when you start taking quantum mechanics into account, but this is a small correction which we won’t focus on here.) All of our current telescopes collect photons, and as I just mentioned, when photons get close to a black hole, they fall in, so this means a detection with current technology will only be indirect. What are these indirect detections we have made? Well, general relativity makes numerous predictions about black holes. After we confirm enough of these predictions to a high enough precision, and without a viable alternative theory, we can safely conclude that we have detected black holes. This is similar to how many other areas of science work, like particle physics finding new particles through detecting a particle’s decay products, for example. 1. Sgr A*: There is overwhelming evidence that there is a supermassive black hole at the center of our galaxy, the Milky Way. As a quick note, most of the black holes we have detected are broken into two categories, solar mass, where they are only a few times more massive than our sun (5-30 solar masses), or supermassive, where the mass is about solar masses. Some of the most convincing evidence comes from the picture below. Andrea Ghez and others tracked the orbits of several stars around the center of the Milky Way for over twenty years. We have learned that these stars orbit around a point-like object with a mass on the order of solar masses. Measurements in the radio spectrum show that there is a radio source located in the same location which we call Sagittarius A* (Sgr A*). Sgr A* is moving at less than and has a mass of at least solar masses. These bounds make it pretty clear that Sgr A* is the same object as what is at the focus of these orbits. A radio source is exactly what you would expect for this system because as dust particles get pulled towards the black hole, they collide and friction causes them to heat up, and hot objects radiate photons. 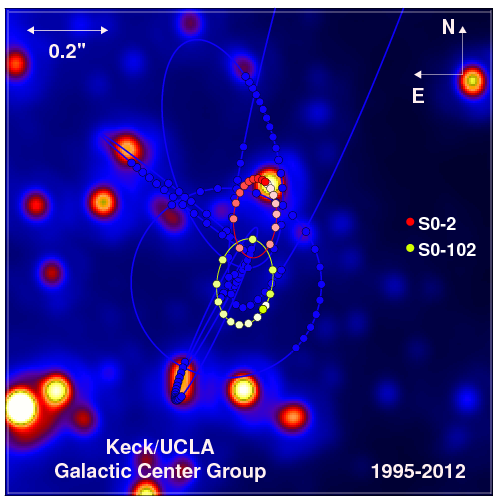 These arguments together make it pretty clear that Sgr A* is a supermassive black hole at the center of the Milky Way! What are you looking at? This plot shows the orbits of a few stars around the center of our galaxy, tracked over 17 years! 2. Orbit of S2: During a recent talk that Andrea Ghez gave at Caltech, she said that S2 is “her favorite star.” S2 is a 15 solar mass star located near the black hole at the center of our galaxy. 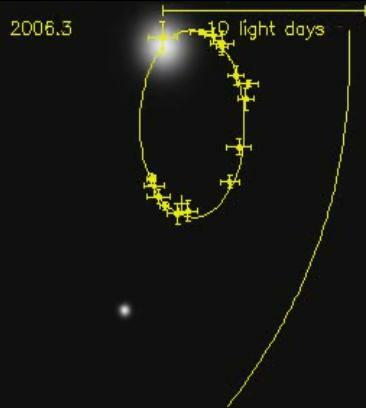 S2’s distance from this black hole is only about four times the distance from Neptune to the Sun (at closest point in orbit), and it’s orbital period is only 15 years. The Keck telescopes in Mauna Kea have followed almost two complete orbits of S2. This piece of evidence is redundant compared to point 1, but it’s such an amazing technological feat that I couldn’t resist including it. We’ve followed S2’s complete orbit. Is it orbiting around nothing? Something exotic that we have no idea about? Or much more likely around a black hole. 3. Numerical studies: astrophysicists have done numerous numerical simulations which provide a different flavor of test. Christian Ott at Caltech is pretty famous for these types of studies. Image from a numerical simulation that Christian Ott and his student Evan O’Connor performed. There is a supermassive black hole at the center of this image which powers the rest of this action! The black hole is spinning and it emits relativistic jets along its axis of rotation. The blobs come from the jets colliding with the intergalactic medium. 5. AGNs and Quasars: these are bright sources which are powered by supermassive black holes. Arguments similar to those used for Cyg A make us confident that they really are powered by black holes and not some alternative. 6. X-ray binaries: astronomers have detected ~20 stellar mass black holes by finding pairs consisting of a star and a black hole, where the star is close enough that the black hole is sucking in its mass. This leads to accretion which leads to the emission of X-Rays which we detect on Earth. 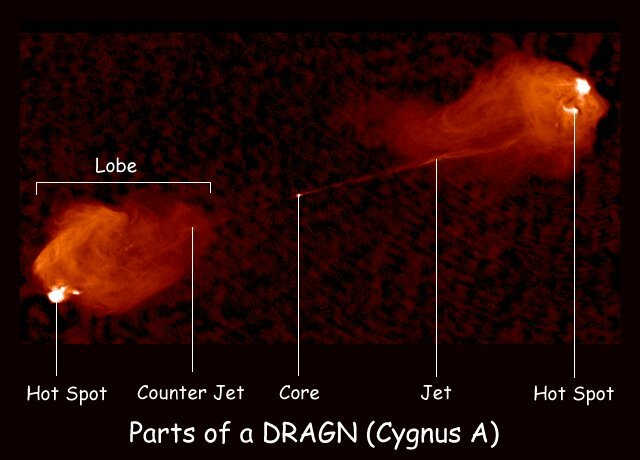 Cygnus X-1 is a famous example of this. 7. Water masers: Messier 106 is the quintessential example. 8. Gamma ray bursts: most gamma ray bursts occur when a rapidly spinning high mass star goes supernova (or hypernova) and leaves a neutron star or black hole in its wake. However, it is believed that some of the “long” duration gamma ray bursts are powered by accretion around rapidly spinning black holes. 1. Firewalls: I mentioned this paradox at the beginning of this post. This is the cutting edge of quantum gravity which is causing hundreds of physicists to pull their hair out! 2. Feedback: there is an extremely strong correlation between the size of a galaxy’s supermassive black hole and many of the other properties in the galaxy. This connection was only realized about a decade ago and trying to understand how the black hole (which has a mass much smaller than the total mass of the galaxy) affects galaxy formation is an active area of research in astrophysics. In addition to everything mentioned above, I want to emphasize that most of these results are only from the past decade. Not to mention that we seem to be close to the dawn of gravitational wave astronomy which will allow us to probe black holes more directly. There are also exciting instruments that have recently come online, such as NuSTAR. In other words, this is an extremely exciting time to be thinking about black holes–both from observational and theoretical perspectives–we have data and a paradox! In conclusion, black holes exist. They really do. And let’s all make a pact to read critically in the 21st century! Cool resource from Sky and Telescope.